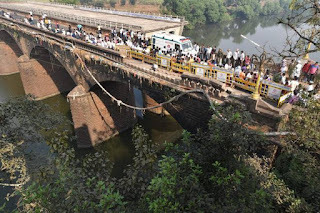 PUNE (KOLHAPUR): At least 13 people were reportedly killed and three others injured after a mini-bus ferrying 17 passengers met with an accident and fell into Panchganga river at Kolhapur in Western Maharashtra, police said. As per reports, all the commuters belonged to Balewadi in Pune. 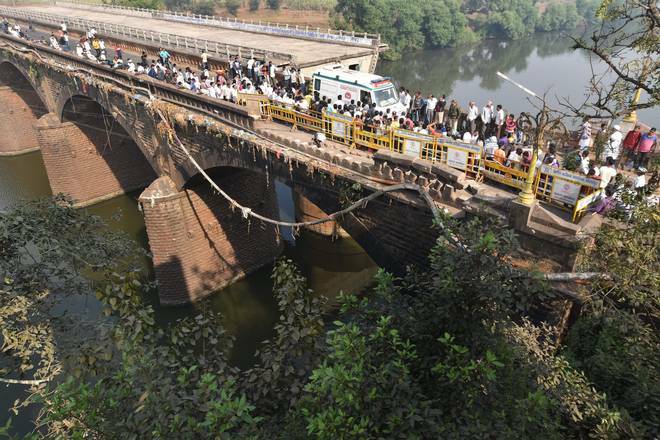 The mishap is said to have occurred at around 11.45 pm on Shivaji bridge on Friday after the driver lost control of the vehicle, a Kolhapur police official told pune-news.com. The bus was travelling from Ganpatipule to Pune. All the passengers on the vehicle, belonging to a family, were on a temple tour in Maharashtra, reports said. Locals reportedly informed police officials and the fire brigade about the incident, following which a search and rescue operations were launched at the site. Out of the seven persons rescued from the river four were declared brought dead at a hospital while three injured are undergoing treatment, the official said. The search for other passengers was undertaken by the teams of police, civic authorities and locals, he said, adding senior police officials were on the spot. As per reports, the search and rescue operations went on for four hours.